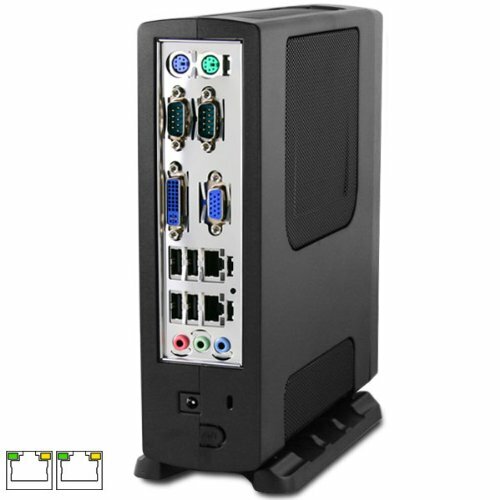 Fully assembled, Mini PC system featuring the Intel Atom D2500 processor with Dual Gigabit LAN ports and Dual COM ports. Great for industrial applications that require legacy serial ports and would benefit from having 2 LAN ports. Low power consumption and low heat generation make this unit ideal for remote installations. On-board Mini PCI-E expansion port allows you to expand the functionality of the system and still retain its compact footprint. A 60GB SATA Solid State Drive is installed for reliability and quick access of system files and program. VESA mounting hardware included. Mitac PD12TI Desktop Board D2500CCE is integrated with the Intel® AtomTM processor D2500 and the Intel® NM10 Express Chipset to offer a stable Dual Gigabit LAN solution. This motherboard also provides dual-display support and LVDS (w/ built in inverter) as well as legacy support in the form of dual COM ports and an internal Parallel header. Due to 64-bit video drivers being unavailable from Intel, we'd recommend a 32-bit operating system. 60GB 2.5" SATA Solid State Drive Installed.